Kazushige Numata and his wife Kayoko have two sons. The first son Shinichi studies well, but the second son Shigeyuki does not. Kazushige and Kayoko are worried about Shigeyuki, who might even fail to enter high school. Making things worse, Shigeyuki stays at home and don't go to school. Kazushige and his wife Kayoko finds an ad for a private tutor on the internet. They contact and then meet Yoshimoto (Sho Sakurai), who is the private tutor. During their meeting, both parties lays out one condition to work with each other. The father stipulates that Shigeyuki must go back to school within a week or Yoshimoto will be fired. Meanwhile, Yoshimoto stipulates that the parents must not interfere with his work. Yoshimoto's extraordinary teaching methods then influences not only Shigeyuki, but also his entire family. 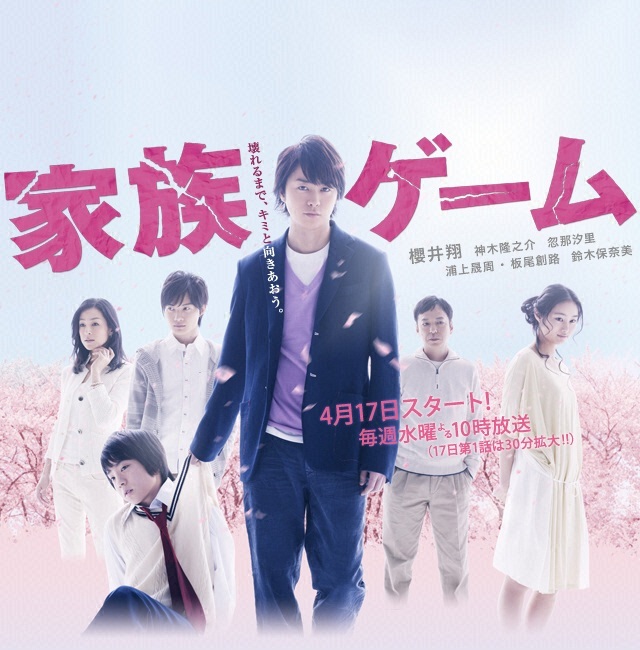 Based on novel "Kazoku Gemu" by Yohei Honma (published in 1982 by Shueisha Inc.). So Wo Jan 10 2018 3:13 am I just wanted to watch kamiki and sho. Stayed for the story and was absolutely hooked I binged it. I watched this show before but watching it again I was just on a roller coaster! Not only that, how they address extremely taboo topics is on point and in your face. And if there's any lesson, it's to not not ignore your surroundings, don't be part of the problem and especially, speak up and allow people to help you. This is indeed a huge problem especially in japan and Asia alone. We tend to conceal and deal with our problems on our own,masking as if everything is fine. Family game..yoshimoto likes to say I'm going to break you"
Nurmayani Oct 30 2016 7:40 pm Defintely one of the best japanese dramas that ive seen.. highly recomennded!! fairuza May 07 2014 2:09 pm First half of the series I thought this was like a family invasion version of Aku no Kyoten, except that we never get to see fully naked service of Sakurai, like what Itou-san did in that movie. Anyway~ Then I had a feeling this might be another Maou-ish series where the psychopath was just plotting a very complicated revenge over a bullying history. and THEN the running half naked of Sakurai made me forgot the whole drama thing that was going in the background. then finally, like every typical j-drama, the last two episodes of this show proves that it was nothing like what I thought it was about, because apparently (SPOILER!) since every one is a big Psycho, none of them is the hero! And guess what!? (MORE SPOILER!) The whole world is the real psycho. ARASHI is finally an-almost a complete package of effective-psycho-working-actors, and Aiba better get his psychopath-acting working fast if he doesn't want to be left out from the Arashi Asylum. Conclusion: Love it! and If you haven't watched it yet, WHAT ARE YOU DOING HERE??! Go buy the DVD now! Shreeya Dec 16 2013 3:22 pm Excellent acting by Sho Sakurai and Ryunosuke Kamiki.The drama focuses on human psychology and emotions.This drama is a MUST WATCH for everyone.The most intriguing part is that we couldnot know the actual truth of Sho,of the person he was,Maybe season 2 can be made by that. docalion Jul 13 2013 2:08 am Wow!! Super great drama!!! Full of suspense and excitement!! Supeerrr recommended!! My only regret is not seeing a dramatic farewell between Shige-chan and Sensei!!! Their student-teacher relationship was really fun to watch and they had a very good chemistry!! Nevertheless, it was really a super great drama!! Love you Sho Sakurai!!!! My 2nd best Arashi member! Mukyaaa!! Juergen Zhi Jun 10 2013 9:13 am Kitahara Rie is really cute isn't she? XD . Shou act is really cool btw. the story is really unprediction.. perfect! Satorin May 06 2013 3:22 pm A very intriguing drama that is warped and yet keeps things up in the air. Can't wait to see how it develops even further. Definitely recommended!